Be the first to share your favorite memory, photo or story of Donald 'Don'. This memorial page is dedicated for family, friends and future generations to celebrate the life of their loved one. Peacefully at Grey Bruce Health Services, Owen Sound on Sunday, March 24, 2019. Donald Gary Scott Chadbolt, at the age of 74 years. Beloved husband and best friend of Joyce (nee Law) for almost 41 years. Predeceased by his parents George and Pat. Beloved father of Joanna, Scott (Lori), Joyce (Mark), Dan (Karen), Julie (Mark), and Randy -predeceased- (Shannon). Cherished Papa to Christopher, Caillie, Andrew, Jennifer, Nicole (predeceased), Sean, Steven, Ryanne, Joel, Daniel, Jesse, Adam, and Tara. Great-Papa to Natalia, Neeka, and Nash. Devoted brother of Sharron (Pete), and Barry (Barb). Also sadly missed by his many friends. 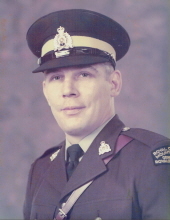 Don was proud to have served his community through his time with the OPP, RCMP, and Metro Toronto Police Force as well as his work with the Independent Order of Odd Fellows. Friends are invited to gather with the family for visitation at KITCHING, STEEPE & LUDWIG FUNERAL HOME, 146 Mill St. N., Waterdown on Friday, March 29 from 2-4 and 7-9 p.m. and on Saturday, March 30 from 1-4 p.m. Donations to BPHS Foundation would be greatly appreciated. "Email Address" would like to share the life celebration of Donald 'Don' Chadbolt. Click on the "link" to go to share a favorite memory or leave a condolence message for the family.